It is a fascinating exercise to piece together a life. There are facts, there are impressions and there are imaginations, but the life lived, largely remains hidden and untold. 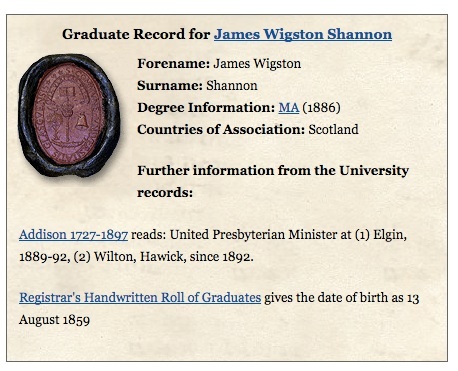 In the case of James Wigston Shannon, Molly Whitelaw’s father, facts exist for his ordination and induction into South Street United Presbyterian Church in Elgin, Moray in 1889 along with his later ministries. Unlike her mother’s family of which she was intensely proud, Molly makes next-to-no reference to her father’s past. The one lead she gives is a connection with her Irish roots. The name Shannon suggests this. The other facts known are his attaining a MA from the University of Glasgow and the completion of his theological training in 1889, but what of life before these two happenings? I keep asking myself if it is really necessary to know more about James and his past? Can I manage to piece together Molly’s life without this knowledge? No doubt, I can. Molly was close to her father, regularly referring to his love of people, his wisdom and his solid faith; his contribution to many of her decisions held a significant place in her life. These tempting insights she reflects on pushed me to seriously see what I could discover. As we do today, I ‘googled’! University of Glasgow records confirmed the MA was gained in 1886. A 1900 on-line publication of the History of the United Presbyterian Church, which I discovered was held in the Hewitson Library, Knox College, Dunedin, informed me on the Elgin Parish, but gave no personal information. After hitting numerous dead ends, and rather reluctantly, I succumbed and paid to search the Ancestry genealogy site (my 14 day free use had expired). Following the various leads that come up on such a site has been helpful at one level and frustrating at another. But along with the British Newspaper site, similar to our Papers Past but not as user friendly, I began to build a profile. 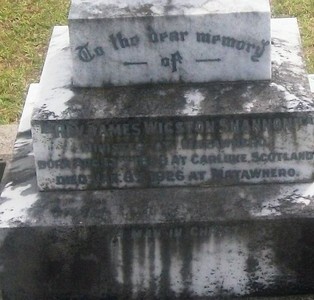 John Shannon, James’ father arrived with his family, in West Scotland around 1841, when Ireland was experiencing political and religious strife and the beginning affects of the potato famine. The 1851 census lists his occupation an iron-sand miner.John Shannon married Mary Wigston in 1853 and settled in and around Carluke Parish, central Lanarkshire. He continues mining until in 1873, he died of a lung disease as a consequence of long-term mining. James born in 1858, was the third of nine children. His primary schooling took place at Braidwood School, but not all of it. The 1871 and 1881 censuses indicate he lived at home and both years give his occupation as a coal-miner. In 1871, he was 13 years old, just a young lad to go into the mines! His brothers also became coal-miners, although a couple went into other occupations later in life. His sisters were domestic servants until their marriage. At this point of the research a sharp class difference exists between Molly’s Renton family links, an upper- middle class drapery merchant family, and this Irish coal-mining, working class family. During the decade 1881 to 1891 however, James’ life took a highly significant turn. What these records don’t tell us is why or how? During 1883 he began a degree course in Arts at Glasgow University, then completed his theology course at the United Presbyterian Theological College in Edinburgh mid-1889. Was it through these years that he met his future wife Agnes Elizabeth Renton who lived in Edinburgh? That question must be put to one side at present. More importantly how did his change of direction come about? Had he planned for this from an earlier age? Were the family closely connected to the church to influence him? Was there a friend/minister who may have encouraged him to enter ministry? What level of schooling entitled him to enter a University? Did he receive a scholarship or equivalent to complete a degree? What was happening within the community or Scotland that turned his attention to a change of direction for his life? The Moody and Sankey religious revival campaigns passed through Lanarkshire in 1876, what affect could they have had on an impressionable 18 year old who may not have wished to be always a coal-miner? Newspapers indicate that Joseph Cook, the evangelist, visited Harestanes in 1882, where James lived with his mother who had remarried. Did his visit add to what James had already experienced or did he experience a conversion then? My exploration thus far then, adds further mystery and many more questions. I doubt these questions will be easily answered from this distance. So more threads are added to the already existing lose threads that are lying to one side of my research. Me thinks it becomes increasingly clear that the best way to resolve these growing mysteries and to be able to weave these threads into my story, is with a trip to Scotland ! James Wigston Shannon, came to New Zealand under the Presbyterian Home Mission scheme in April 1921. He began his ministry at Morere-Nuhaka. In August 1923, he transferred to Matawhero, Gisborne. He died in office January 1926.